Mihret lives with her both parents. She has one sister and two brothers. She is the first born child. 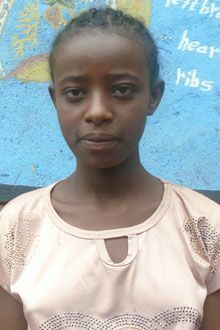 Her father is a farmer and the family dwells on subsistence farming and her mother tries to earn more money by selling injera in the local market. However, the income is barely enough to fulfill the family?s basic needs. Since her family has no capacity to send Mihret to school; Yesus Mena school for the deaf has been enrolled her two years ago even though she is a hearing child. She is a healthy child both mentally and physically, without any medical concern. Mihret is a hearing child. She is from highly impoverished family and was unable to go to school because her family was unable to address her educational material needs. The opening of Yesus Mena school for the deaf & child?s enrollment in Holt?s sponsorship program will help her pursue the inclusive education that is being given by the deaf school. Tell your friends Mihret needs a sponsor!